And Union. A brewery seemingly designed to make all of my previous English teachers twitch every time I begin a sentence with its name. And Union, a brewery which for the longest time baffled me a bit with its rather abstract approach to self promotion on social networks. And Union would post a cool picture with a beer bottle, and then maybe another cool picture of a table or something, and this reporter didn't see any long spiels about how their beer was available in a bar somewhere, or a shop, or even (not at first, at least) a clear cut statement to say that Brewers And Union (to give the brewery its Sunday name) was indeed in the business of beering people. The crashing halt I came to last Saturday when I walked past Glug, a beer shop in Newcastle's Grainger Market and one of my regular haunts, was brought about entirely by the glimpse of some of And Union's beers in the shop window. I tried to press on them twice in quick succession, I tried to "smash that mf heart button", but realised that this wasn't Instagram but in fact reality! 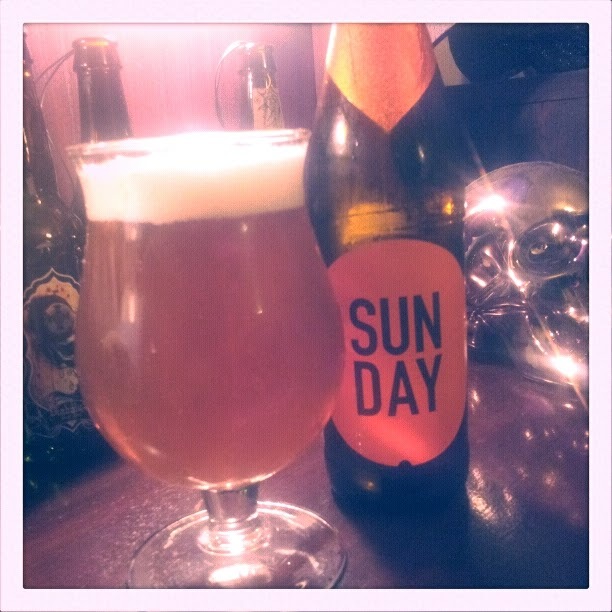 And now it's time, on this rainy Sunday evening, to open a bottle of Sunday Pale Ale, 500mls of Internet Cool. Gentle waves of spice roll over the senses as the mist rises from the open bottle neck, and on further inspection banana scents are also present, though not as full-frontal pugilistic as they are in a Weissbier. The pour is the lightest of caramels, elegantly glugging a half litre of dusty, dirty brass into the glass, with an uneven head of creamy-white, irregular bubbles. After seeing about a million servings of And Union eye candy, the excitement about drinking this beer is almost shameful. There's probably a complex German word for the complex feelings one gets when they realise that marketing has worked on them. The scent from the glass is spice and dryness, old cellars; clean but dusty. No rot, no decay, just gentle abandonment, and all this passes the nose as the mouth crashes into the foam and takes in a mouthful of bitter orange-peel. 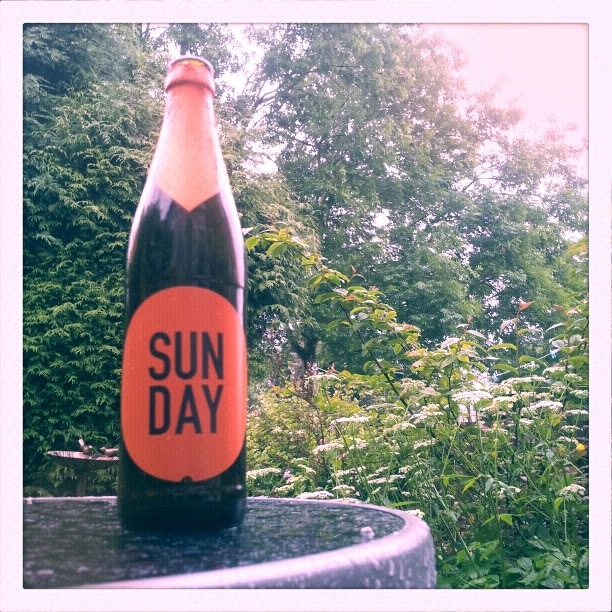 There is a sense of rustic invigoration as Sunday shows itself to be a beer well suited to putting away before getting back to cutting wood. The bitterness tickles and occasionally slaps the back of the throat, as caramelly malt swirls around the mouth. The cheeks pucker a little from the bitterness, as lacing like torn net curtains hangs down the inside of the glass. The 5.5% abv begins to numb the tongue after holding the beer inside the head for a few deep forensic scrapes and this seems to dull the bitterness slightly, allowing the sharp orange-peel flavour-knife freedom of movement to slowly excoriate the tastebuds. By this point there is only a mouthful and a half left in the glass. The spicy scent filling the dead space between liquid, glass rim and journalist, has grown almost to the level of a saison and your correspondent inhales it with wild abandon. The final mouthful clattered about in the skull and then swallowed is selection box caramels bullied into submission by burly oranges. Very little aftertaste lingers, a little spice floating from tastebud to tastebud, playing "The Floor Is Lava" on the tongue a few minutes before losing the game and ghosting. Brewers And Union has brought to the table a good, earthy pale ale with uncomplicated tastes executed well. 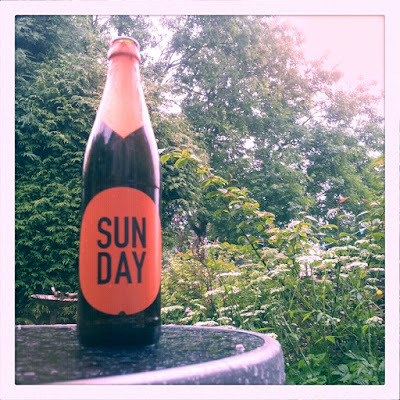 The slick, shareworthy social media presence of the brewery had a good product behind it, not a massive surprise but certainly a relief and a pleasing outcome. When brands are hitting higher and higher notes in the "style over substance" song (Voss Water, please take a bow and then delete all your accounts) it's getting easier to react cynically and suspiciously, but tonight's beer delectation was like a Scooby Doo monster pulling off its mask to reveal that it actually was a monster, and that pulling its face off was just one of the many cool and gross things it could do. Then it killed all of the Scooby Gang. Apart from Velma, who texted me that night.